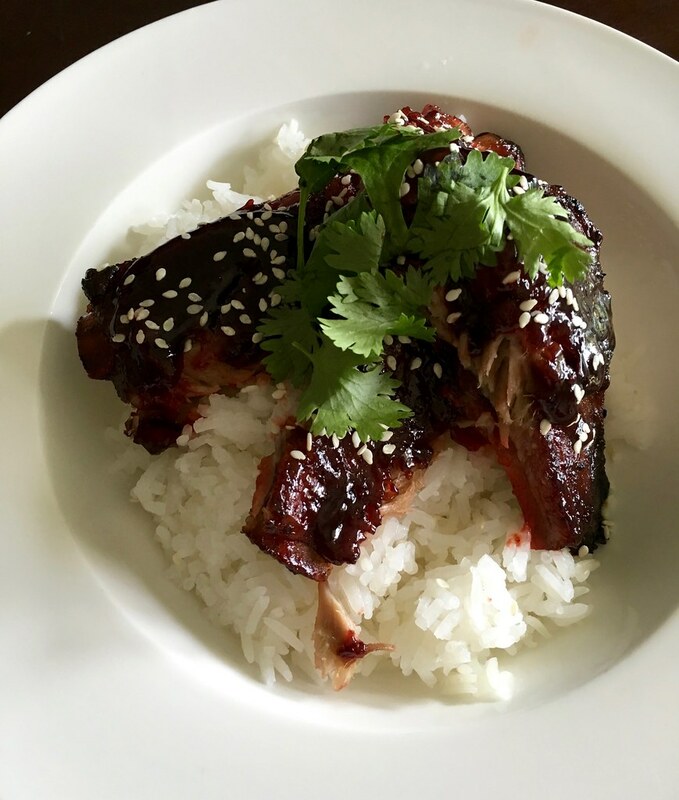 Everyone loves Char Siu – or Chinese BBQ pork as it’s probably more well known around Australia. Seen hanging from hooks in Chinese takeaway shops glass displays, dripping with sweet, sticky maltose, char siu truly is an iconic Cantonese dish. Char siu is so beloved, it’s easy to see how Char Siu Bao (fluffy white steamed Chinese barbecue pork buns) is one of the most popular items to be ordered at yum cha around the world today. I used to enjoy eating this dish on trips to Hong Kong on steamed white rice with Asian greens as a child, and now as an adult and of course have had a few char siu baos in my time! Martha taught me how to cook char siu, sweet and sour pork, Hong Kong style fried rice, “Singaporean” noodles (I say that in inverted commas because Singaporean noodles actually originate from Hong Kong, not Singapore) and Cantonese roast duck. It was an absolutely wonderful class that I highly recommend. I can honestly say that I learned more about cooking in one day with Martha than I have in all of my culinary classes – and that’s saying a lot. However, Martha made me swear secrecy to all the recipes I learned from her school on pain of death (fair enough – they are really good recipes!) so I have come up with my own “Australian-ised” version of Char Siu with ingredients that are much easier to source in our home supermarkets. 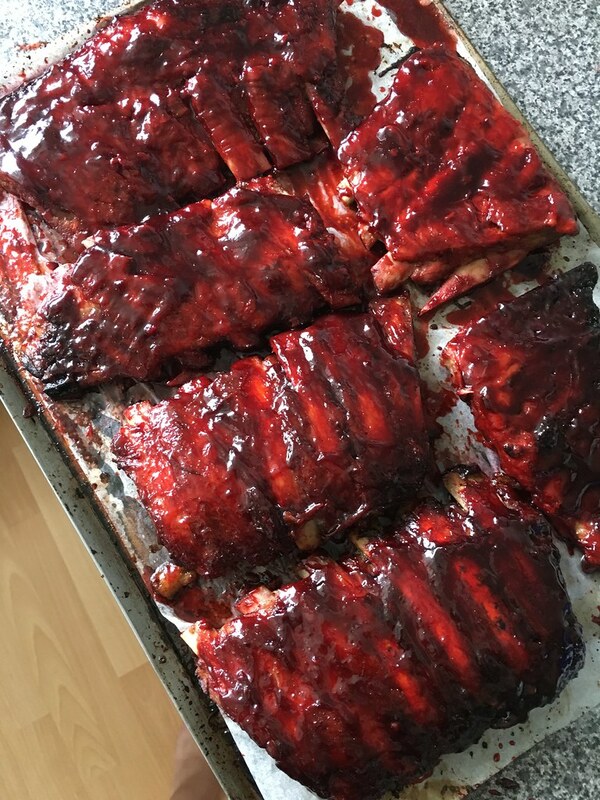 I hope you enjoy these ribs as much as I enjoyed making them! 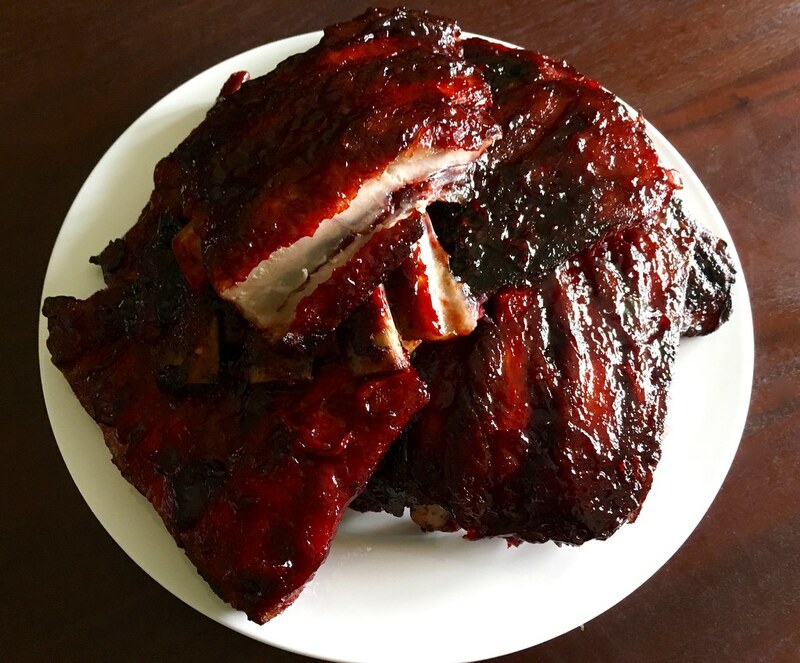 Ribs contain a lot of connective tissue, which basically means that they require long cooking methods in order to become tender and soft. To achieve that, we’re going to braise our ribs in a flavoursome liquid in the oven for a couple of hours. 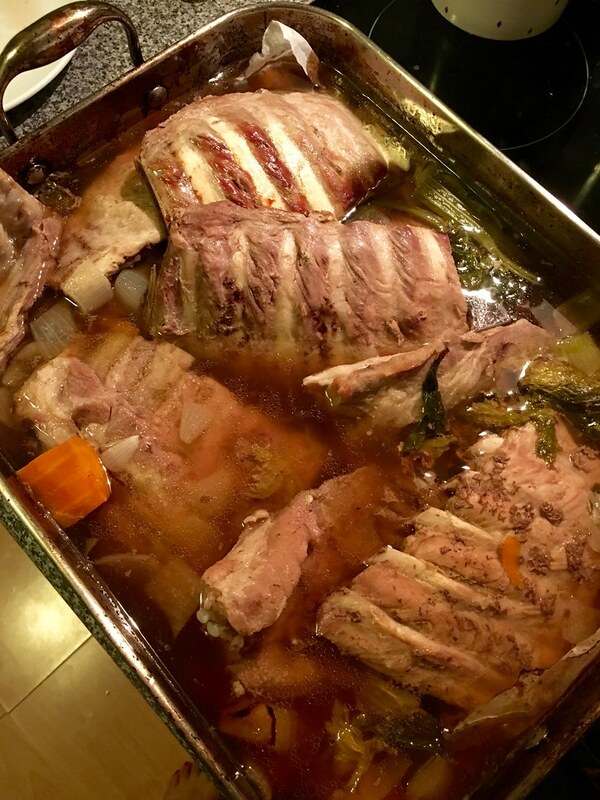 I used a regular mirepoix, chicken stock and brown sugar to help add flavour and braised my ribs in a deep roasting tin for 3.5 hours at 180 degrees C.
It was more convenient for me to do the braising the night before I wanted to serve, so after they finished braising, I popped them into the fridge & finished the glazing process the following day. This can be handy from a catering point of view if you want less work on the day you plan to serve these. However if you have enough time, you can definitely do these all on the one day. Since the ribs are basically cooked through, you can pretty much glaze them with whatever you want. 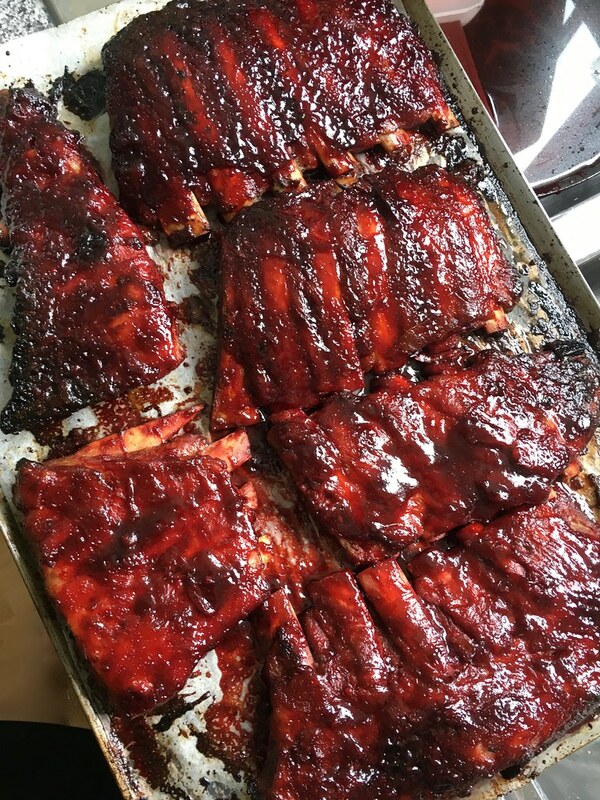 Next time I’m thinking a spiced maple orange glaze, or Tea for Tammi has a pretty excellent recipe for balsamic glazed ribs over here that looks fairly amazing. I made my glaze using ginger, garlic, hoisin sauce, brown sugar, Chinese five spice, soy, honey and sesame oil. 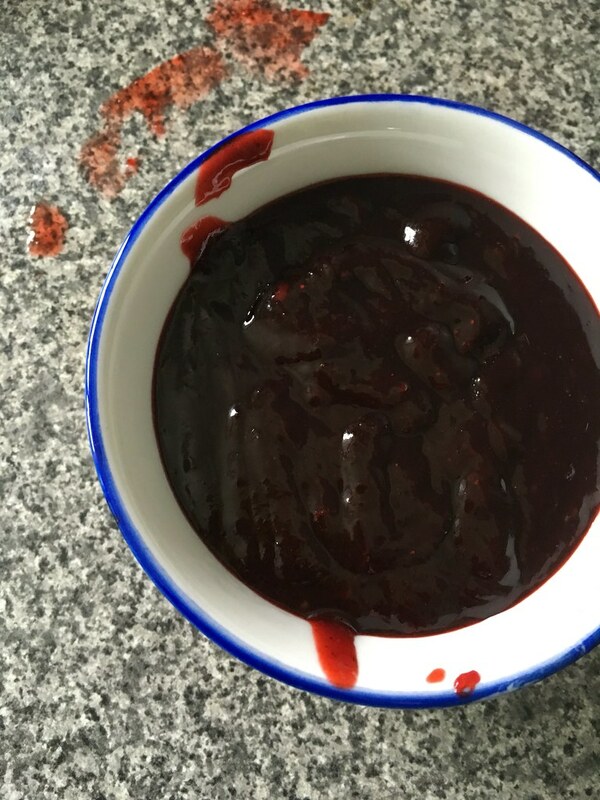 Oh and don’t forget the “secret” Char Siu ingredient that gives it that vibrant colour – red food dye, of course. You could use this glaze on pork shoulder to make proper Char Siu or on chicken or beef for different varieties of Char Siu – it’s pretty good on any meat. I glaze the ribs not once but twice to give it that ultra-shiny, sticky, perfect exterior you want when you’re eating ribs. First glaze from the oven. Second glaze out of the oven. Serve it up on freshly steamed rice and sprinkle with sesame seeds & coriander leaves. Preheat oven to 180 degrees. Halve each rib section just to make them easier to work with, season with salt and pepper and set aside. In a deep roasting pan, line the bottom with baking paper (this just makes it easier to clean later on). Pour in chicken stock and add brown sugar, stirring to dissolve. Add in roughly chopped vegetables, garlic and star anise if using & lay over pork ribs. The stock should be just enough in the roasting pan to just partially cover the ribs (if not, add some water to help partially cover). Cover tightly with foil and place in the oven for 3-4 hours or until pork ribs are tender. Every hour or so, take the ribs out and flip them around to make sure they cook evenly. When you can stick a fork into the ribs fairly easily, remove from the oven and allow to cool for at least 30 minutes. 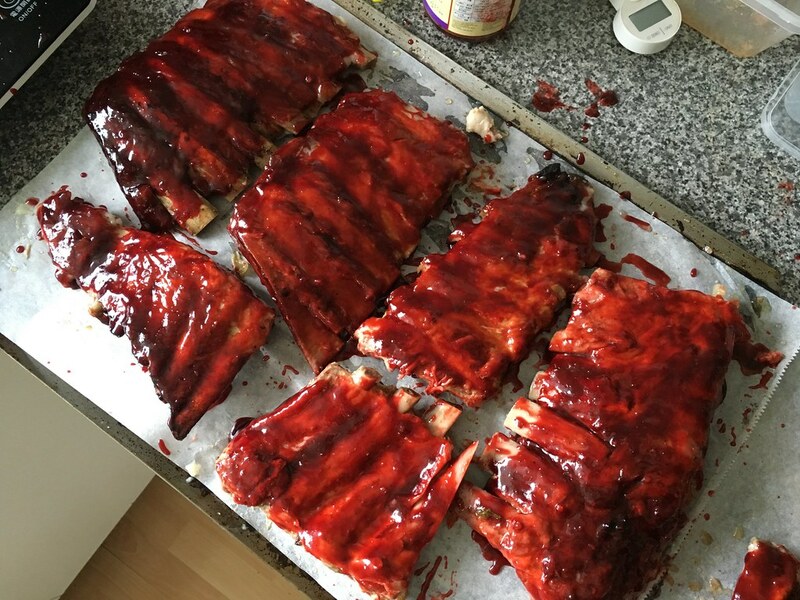 At this stage you could either refrigerate the ribs until you need them or go straight onto the fun step – the glazing! For the glaze, add all ingredients to a small saucepan and stir over low heat for about five minutes, or until sugar dissolves. Raise the heat to high and stir until sauce thickens (about five minutes). Set aside to cool in a small bowl (or you could use the hoisin jar you used to make the sauce just to save on washing up!). Line two baking trays with baking paper (trust me – you do not want the fall out of the sticky caramelised glaze to clean off. Not fun). 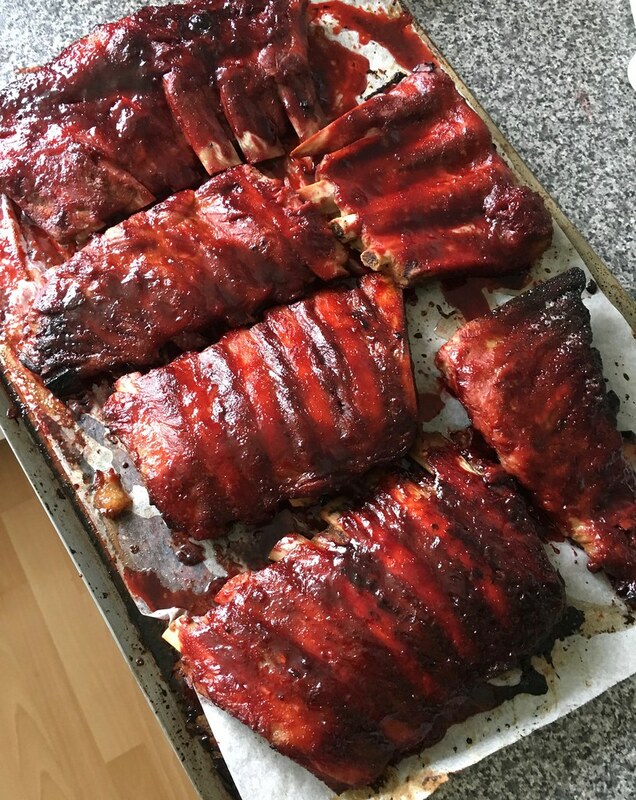 Remove ribs from braising liquid (discard braising liquid) & place ribs on the tray and make sure they have plenty of space and aren’t crowded. Dry off any braising liquid using paper towels – this will help the sticky glaze adhere to the ribs. Make sure your oven is still preheated at 180 degs if you’re continuing on from the braising, otherwise preheat again. Now for the fun part – returning to your childhood! Enthusiastically & thickly paint both sides of the ribs with your char siu glaze until thoroughly coated (finally all those hours painting as a child in a smock is paying off) and return to the oven for 20 minutes (rotate trays halfway through cooking), or until your ribs are sticky, glistening and bubbling. Remove ribs from the oven and apply a second coat. Return to oven for another 10-20 minutes until you can’t deal with not eating ribs anymore (or they are shiny, saucy and fill the house with irresistible BBQ smells). Remove from the oven. For serving purposes you can either separate the ribs individually by slicing them in between the bone or you can leave them whole. Serve with hot steamed rice and sprinkle with sesame seeds & garnish with coriander leaves. Eat, blissfully. O. M. G. I demand char Siu delivery for my dinner. Looks amazing dude. Am to assume that the rice is garlic fried? Oh maaaaan… looks so so good! Finger lickin’ good!